Welcome to ECKA Long Hanborough/Bicester Kickboxing Karate Club, part of the English Contact Karate Association (ECKA) and affiliated by the World Associations of Kickboxing Organisations (WAKO) covering all styles of karate and kickboxing in England. Sensei Steve has been practising martial arts in the Oxfordshire area for 34 years and is a 3rd Dan black belt in full contact karate with ECKA. 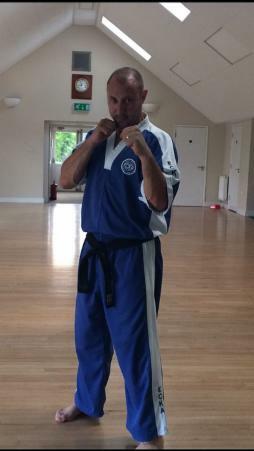 Steve has 3 yrs experience in Wuma kick boxing and also has trained in Tae Kwon Do. Steve has a current CRB check and is trained in emergency first aid. All ages and abilities are welcome from age 6 upwards. All classes are mixed and there is an even spread of children and adults all of varying ability and experience. Don't worry if you have never practised karate or any other kind of martial arts before, all of our students have been in the same position and will make you very welcome. Karate is great for building self-confidence, learning self-defence or just improving general fitness. Long Hanborough karate students have taken part successfully in national competitions but this is entirely optional. ECKA has created a number of very successful competition fighters over the years. For the first few lessons you can wear your own clothes (i.e. jogging bottoms, t-shirt). If you decide that you want to join ECKA Long Hanborough Karate club you will need to complete an application form and pay a one off membership fee of £35.00 which includes your first uniform. The instructors can discuss any other costs involved and answer any queries you may have. ECKA Long Hanborough Karate Club have a good selection of martial arts training equipment that is used during the lessons and this is all included within the training fee. You can contact Steve Rhodes on 07834 022463 or by clicking here, alternatively feel free to come and watch us train at The Pavilion, Long Hanborough Playing Fields, Long Hanborough, Witney. If you wish to join in you are more than welcome. ECKA Long Hanborough/Bicester Karate Club has been established for over 15 years and is run by Sensei Steve Rhodes. The club is situated in the village of Long Hanborough, only 5 miles from Witney and 4 miles from Woodstock in Oxfordshire.